This dish is quite a nostalgic one for me. When I was a 17-year-old apprentice at Tansy's, Mark, our Flemish head chef, cooked a version of this and the combination of tarragon and chicken just blew me away. A simple thing, but a real inspiration for a young cook. I might have been a little bit too enthusiastic about it though, as it meant that I was often charged with cooking it for staff meals, which pushed my prep list to near breaking point. Hard work, but great food and great memories. 1. Preheat your oven to 180C fan-forced or 200C conventional. 2. Heat a wide, heavy-based pot over medium heat (a French oven is ideal for this), add a splash of oil and half the speck, and fry briefly. Season the chicken pieces really well with salt and pepper and add half the chicken to the pot. Brown well all over and remove from the pan along with the speck. Repeat with the remaining speck and chicken. 3. 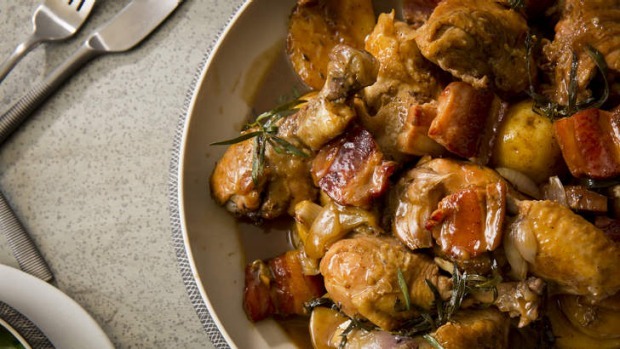 Remove the second batch of chicken from the pot and toss in the eschalots and garlic (with a splash of oil if the pot is too dry) and cook for about four minutes or until starting to brown, remove and set aside with the chicken. 4. Add the potatoes to the pot and cook, stirring, until starting to brown, season. 5. Return the chicken, speck and eschalots to the pot. Add the vinegar and stir, picking up any caramelisation off the pot with your spoon. Simmer for one minute. Add the stock, tarragon, bay leaves and thyme and bring to a simmer. Cover and cook in the oven for 25 minutes. 6. Put the pot back on the stovetop, remove the cooked chicken and reduce the liquid. The potatoes will probably take a little longer than the chicken, so just remove them once they are tender. Take the liquid down to a lightly thickened, saucy consistency. Check the seasoning and adjust if necessary. You can now place the chicken and potatoes on your serving plate and spoon over the sauce or add them back to the pot and take it straight to the table. Serve with a leafy green salad. 1. The pot will start to pick up a dark caramelised crust as you cook the various elements. This is essential to developing good depth of flavour, so don't clean, or change, the pot, just make sure that you pick up all of the crust with your spoon when you add the liquid. 2. If you're not using homemade chicken stock, make sure you're using a quality stock with no added salt or sugar (some commercial stocks have plenty of both). Good chicken stock just doesn't need sweetening and you want to add your own salt, depending on the seasoning of the other elements and how far you reduce the sauce.